Here are some pics from a short day at Camoflage Forest in the Bog Area. I was resting and taking pictures trying to recover from a week of working nothing but hard projects. Brian Arnold and I did a session on the Hoedown project and made a lot of progress. This project seems to be morphing into two different lines but either one will be very hard and very good. I've also been working the extention into Future Present. 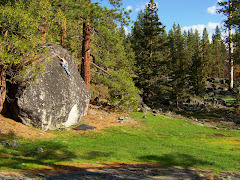 This line will link v8/9 into v11 and will likely be the hardest line in South Lake Tahoe. Noah took a big crew to see Sierra Buttes for the first time and it will be cool to here the news when they get back tomorrow. With more visiting strong climbers coming into town for Noah and Siemay's wedding, this week will probably be filled with lots of news on hard bouldering going down.